If you know me at all, you know I love to read. As an adult, I've discovered I'm no longer discriminating about the 'suggested ages' for the books. I love many of the new Young Adult books as much as (or more than) books written for adults. It seems like YA books are different than when I was a kid. There's a lot more freedom to have a unique story. I felt like YA books when I was a kid were stilted and stuck into one basic pattern. I was asked to review Bash & the Pirate Pig by Burton Cole. I'll admit that we've had the book for a couple weeks and I haven't finished it yet. That's because we are reading it each night as a family. Some nights, we don't get to read if it's too late by the time we get PJs and teeth brushed. Some nights we read 10 pages, some nights only 4-5. Nathan could read it on his own, but the words are too difficult for Rebekah to read. But kids have a much higher auditory vocabulary than written vocabulary so she understands everything in the story. The situations Bash talks Beamer and his friends into just make me roll. I laugh so hard when we read the story. Looking forward to see how it ends--I'm sure it will be a doozy with Bash around. 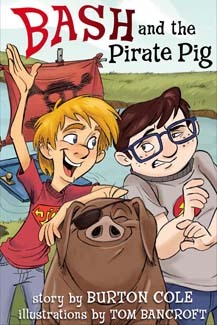 From the Publisher: About Bash and the Pirate Pig: Bash and the Pirate Pig, by Burton Cole, is the story of a cranky city kid named Raymond "Beamer" Boxby who must spend summer vacation at his younger cousin, Bash's, farm. Beamer prefers air conditioning and video games. He can't see what good can come of this so-called country fun that includes riding cows, river rafting with a pig, or playing with skunks. But hang tight, Beamer, because Bash's zany adventures with his "Fishin' and Farmin' book" (The Bible) just might lead to the coolest discovery of all. About the Author: Burton Cole is a Pulitzer Prize nominated journalist with thirty years of experience and more than fifty humor writing awards to his credit. He grew up on a farm in northeast Ohio and attended a small-town church with a slew of cousins and buddies. That same boyhood inspires his colorful stories today. About the Illustrator Tom Bancroft has more than twenty years of experience in the animation and illustration industry and worked with Disney on films including Beauty and the Beast, The Lion King, and Aladdin. Other clients have included DC Comics and Big Idea Productions. Now for the best part, the giveaway. Enter using the Giveaway Tools form below. I'm trying out this new entry method because I'm learning that it's easier to use for you than Rafflecopter. Under the Options at the top, select "Open all at once" and it gives you all the choices for entries. You do the ones you want. Once I learned that little trick, it's saved me lots of time in entering giveaways. Disclaimer: I was given a copy of this book in exchange for my honest review. All thoughts and opinions are my own. Charlotte's Web has always been my favorite! Right now, we love the Sheep in a Jeep series. Such funny stories for both mama and the little ones.